I felt like my family was in good hands with All Pro Restoration. The entire staff was professional, knowledgeable, courteous and hard working. EXCELLENT SERVICE!! HIGHLY RECOMMENDED!! Denver & Aurora flood damage compromises the safety of the structure of your home and should be dealt with immediately. If water damage is not taken care of when the source is first noticed, the damages can increase, costing you, the homeowner, thousands of dollars! Water damage is progressive, creating more damage the longer it goes untreated. It can cause irreparable damage, to your home and even your personal belongings. This is why All Pro Restoration offers emergency water extraction and emergency flood water removal services. 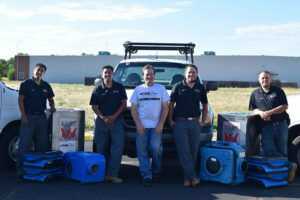 We are your water damage restoration company in Denver and Aurora CO.
Rest assured that from water extraction to dehumidification, All Pro Restoration, a RinCo Incorporated Company, can handle all your drying needs, regardless of scope or scale of the damages. All Pro Restoration is a 24-hour comprehensive water damage Denver CO establishment. Our technicians specialize in detecting unseen or hard to detect water damage with state-of-the-art thermal imaging cameras. All Pro Restoration’s IICRC Certified water damage Aurura CO technicians specialize in water removal and only use proven restoration techniques that will have your home dry in the quickest time frame possible. All Pro Restoration specializes in commercial water cleanup as well. Moreover, our experienced technicians can walk you through the insurance claim process so that your Water Mitigation is as hassle free as possible. In addition to flood water cleanup, we also take care of your sewer back up and sewer line break problems, sewage removal and sewage cleanup Aurora and Denver areas. Sewer water can come from your sewer drain in your basement, your drain pipes to your shower, sink, toilet or washer, a leaking wax ring on your toilet and it can even come from your toilet bowl. Just because the water that is coming out does not look dirty, does not mean that it is not infested with bacteria. If you have a concern with mold in your home or business, call All Pro Restoration for the best home mold inspectors in Aurora and Denver. We will help determine if it is necessary to have a technician inspect the area. If the water source causing the mold is still of concern, we will send a technician that will use thermal imaging technology and moisture meters to determine the severity and threat of the continuance of mold growth. With these instruments we will be able to determine what the water source is that has caused the mold growth and whether or not the water source is continual and needs to be addressed, or if the water source has already been stopped and is no longer feeding the mold. 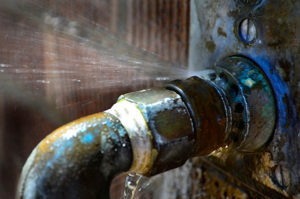 Time is critical when water has entered your home. Whether it is basement water damage, damage from a frozen, broken or leaky pipe, a toilet or sink overflow, a slab leak, a kitchen drain line leak, water heater, refrigerator, dishwasher or washing machine leak, or flooded basement, attic or crawlspace due to storms, we will find the source, stop the flooding, provide full extraction and structural drying, and then full water mitigation and rebuild. Don’t let Denver water damage bring you down, call us at the first signs of trouble. We provide mold removal in Aurora, Denver, and all surrounding metro cities. Mold removal is a fairly natural process in itself, however natural mold removal services can be provided upon specific request – i.e. green mold removal products. Our friendly office staff will also help you setup an appointment with one of our industrial hygienists at Weecycle Environmental. Testing is not free, but it is the only way for a mold removal technician to know they are fully addressing your mold problem. All Pro Restoration is located at 4860 Ironton St, Unit J Denver, CO 80239. We can be contacted 24/7 at (720) 729-0002. We provide water damage Aurora CO services to 80010, 80011, 80013, 80014, 80015, 80018, 80019, 80012, 80016, 80017, 80042, 80044, 80045, 80046, 80047, 80040, 80041. Click here for more services in Aurora. We also provide water damage Denver CO services to 80110, 80202, 80203, 80204, 80205, 80206, 80207, 80209, 80210, 80211, 80214, 80218, 80219, 80222, 80223, 80224, 80226, 80227, 80230, 80232, 80236, 80237, 80238, 80239, 80246, 80249, 80264, 80290, 80293, 80294. Click here for more services in Denver. All Pro Restoration is a locally owned company with a BBB A+ rating and hundreds of satisfied customers across the Denver area. If you have a water, fire, flood, or mold emergency, call now! As an IICRC Certified firm in Denver CO, we have crews ready to answer your call day or night who can arrive in under 90 minutes. We do a thorough inspection of any mold situation in order to find the source of the moisture allowing mold to grow. We are a certified mold remediation company, so you know the job will get done right. A broken pipe in the attic space, at local restaurant, that flooded a large portion of the restaurant. Sewer backup that affected a finished basement with a pool table & home theater system. Industry standard drying methods using only the best dehumidifiers, air movers and extraction equipment. The finished product of a mold remediation that was caused by multiple intrusions of storm water in a basement.